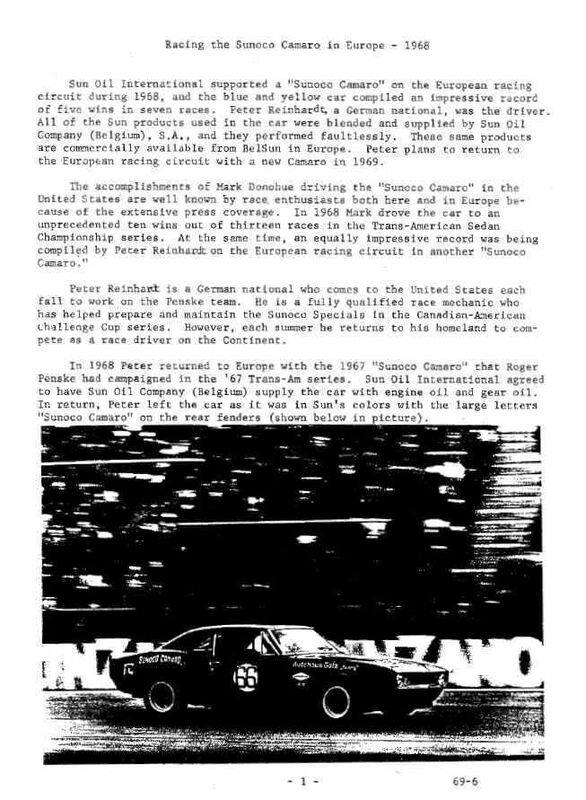 crew member Peter Reinhardt to Europe where he raced the car for McNamara Racing. 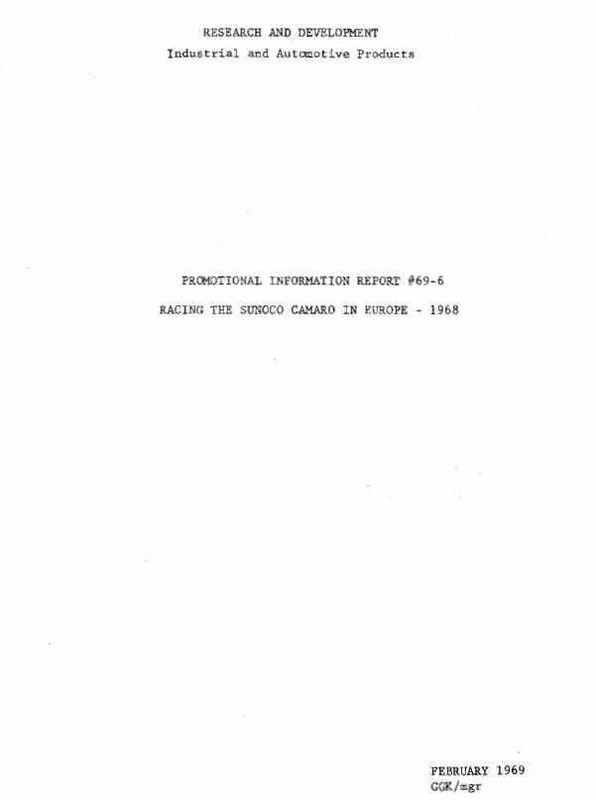 "Racing the Sunoco Camaro in Europe" report comes from Sun Oil's Jerry Kroninger via Wayne Guinn. Very cool article!! I had no idea these cars would fit into a class in europe...thanks for sharing it. Any idea where this thing ended up at? 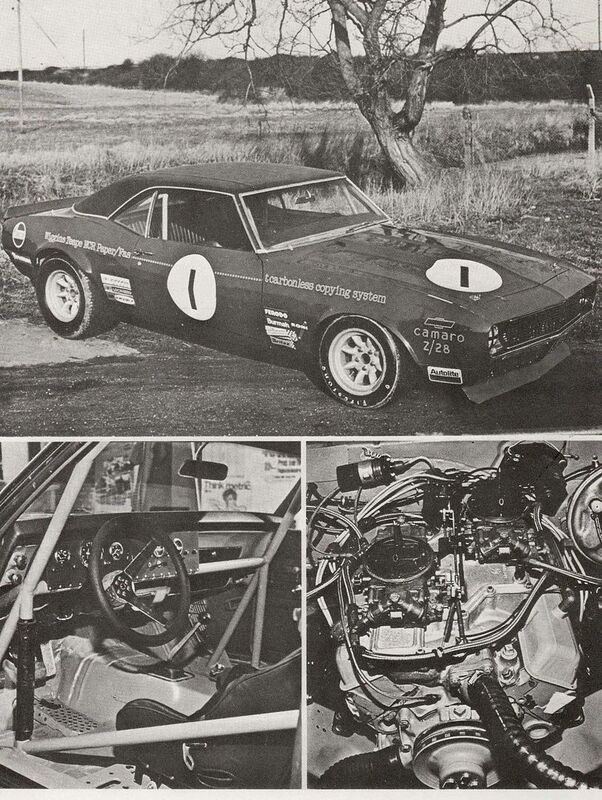 This is the Craig Fisher camaro built at Gorries Chev in Toronto? 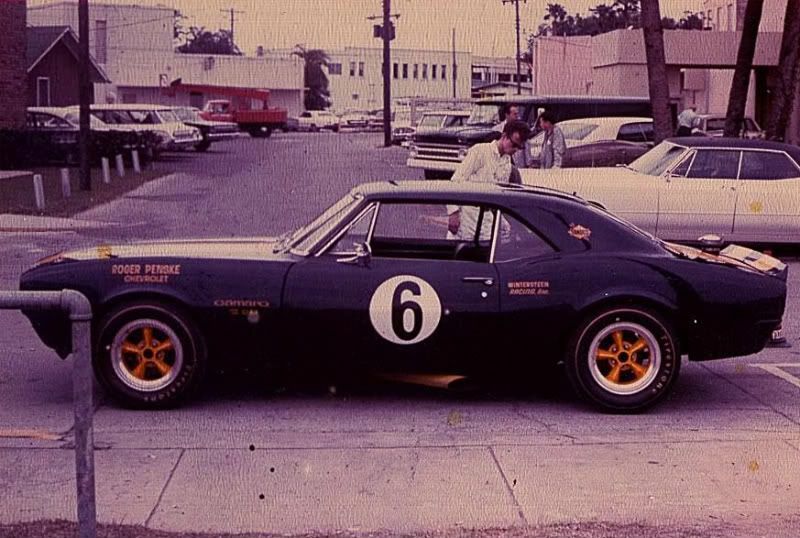 car was built for Donohue in time for the Modesto Trans-Am. shown above, driven by Peter Reinhardt. At Daytona, the Donohue car did not have a full roll cage. 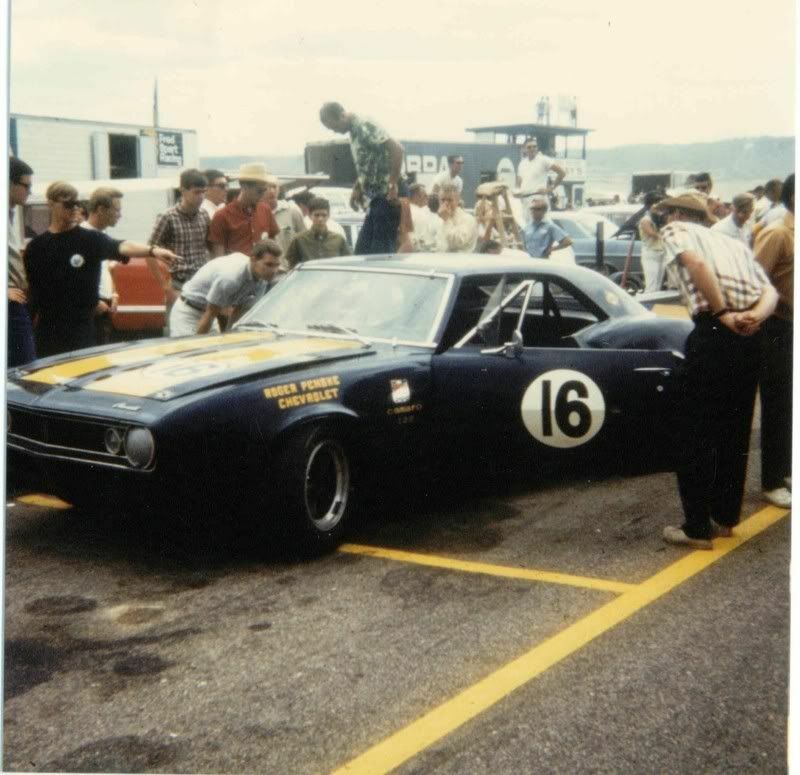 All of the photos below are of the same Penske Camaro taken at different times during the 1967 season. 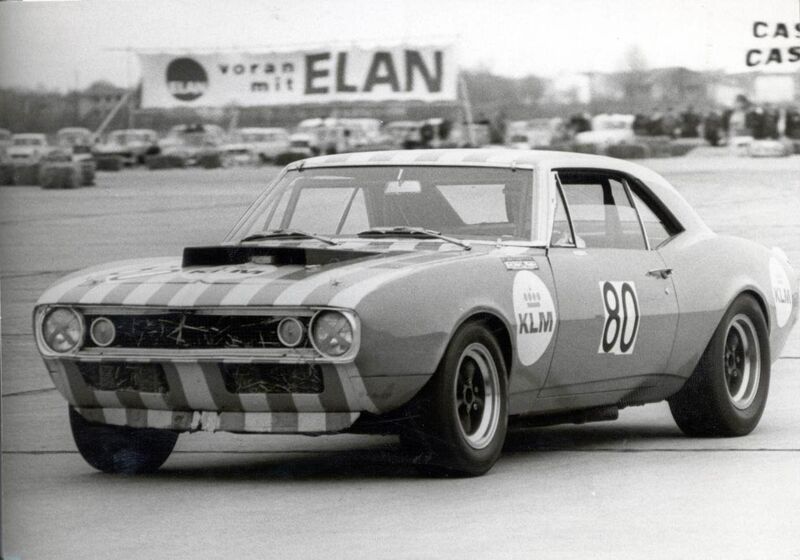 They are all the same car that Peter Reinhardt took to Europe to race in 1968. 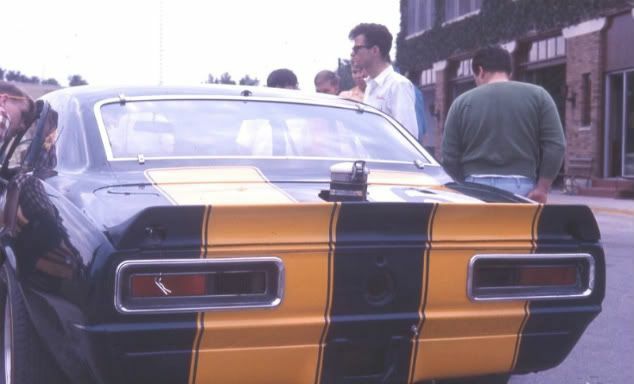 Rear view of Donohue's car, also from the Sebring race, March '67. Bruce McLaren as his co-driver. 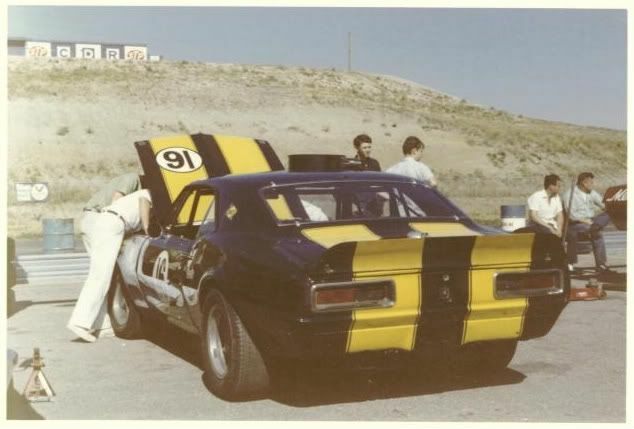 This was George's first ever Trans-Am race. He finished 3rd. 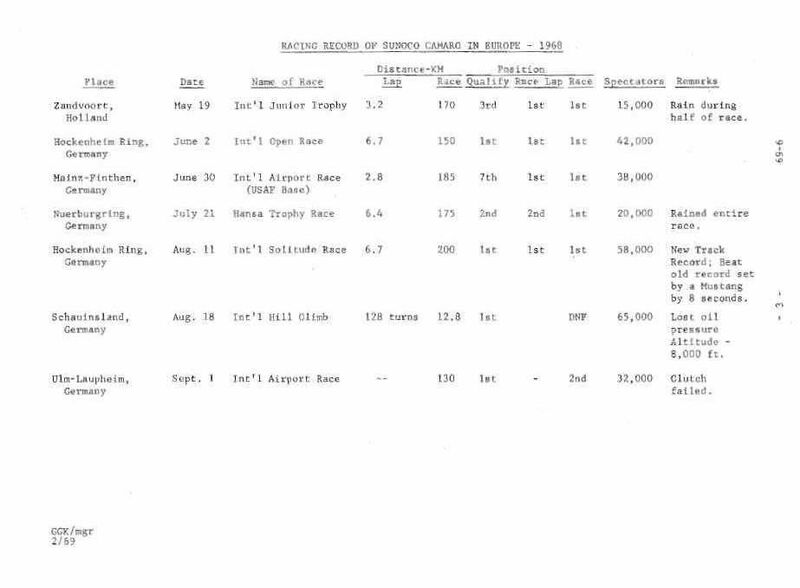 was added to it before the Bryar Trans-Am which took place on August 6th. 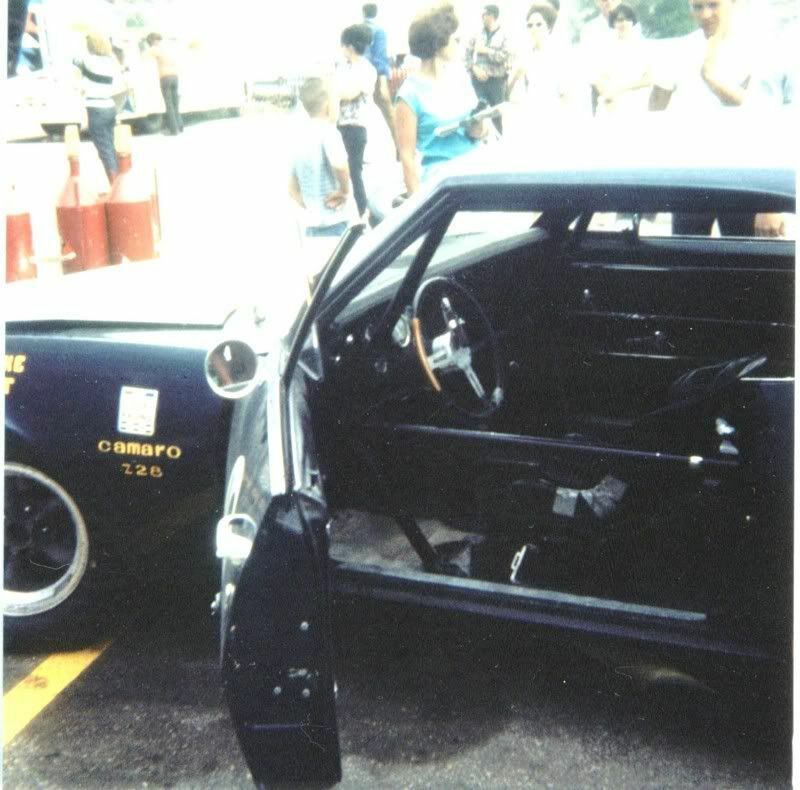 Original Penske Camaro interior at Marlboro. used this car as his primary mount. A new Camaro was ready for him at Modesto in early September. Below is Craig Fisher driving the original Donohue car at Kent in early October while Mark was driving the new car. 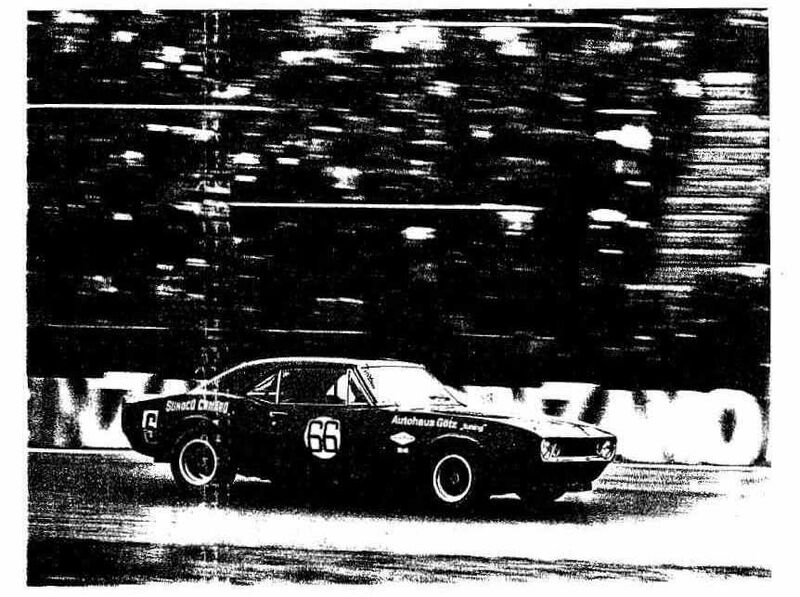 the real owner of the car in '68 also. 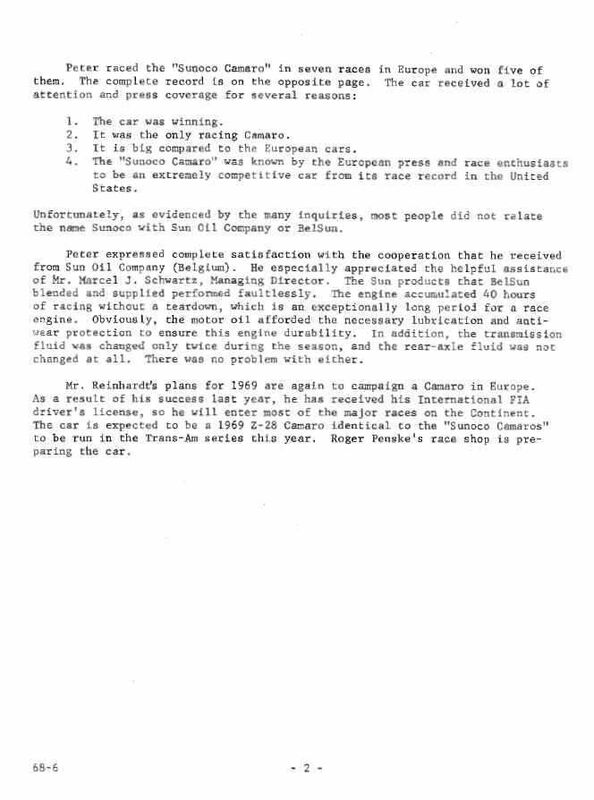 I don't see where Peter Reinhardt had the bucks to buy the car and race it on his own. More photos at these links from May 1969. Notice the clips on the windows are the same ones as when Penske owned the car. The roll cage design is the same also. Great pics Jon! Interesting non production rear spoiler. Did SCCA rules allow for that? Fred, the rules should not have allowed that spoiler but they ran the car with it for at least three races during the middle of the season. race and was out of commission for a couple of races while they rebuilt it. When it returned, a standard rear spoiler was installed. 1969. Does anybody out there have more info on this car, any subsequent owners or drivers, and what may have become of it? 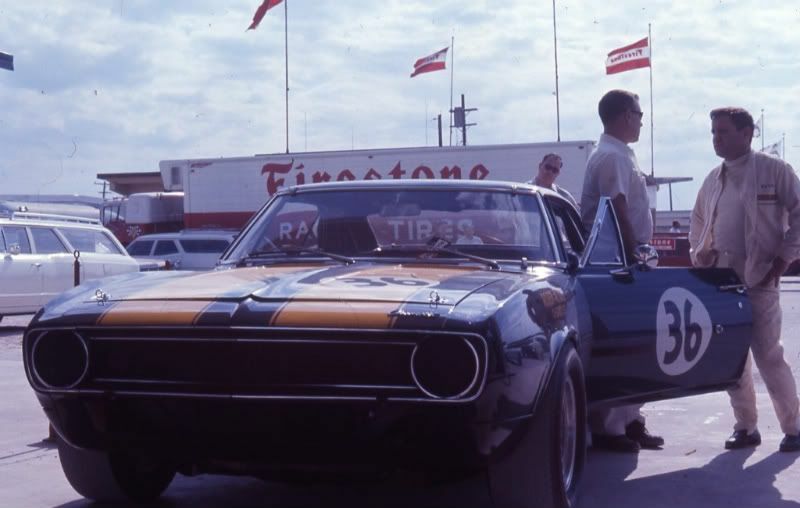 Here's the other Penske Camaro that went to Europe. 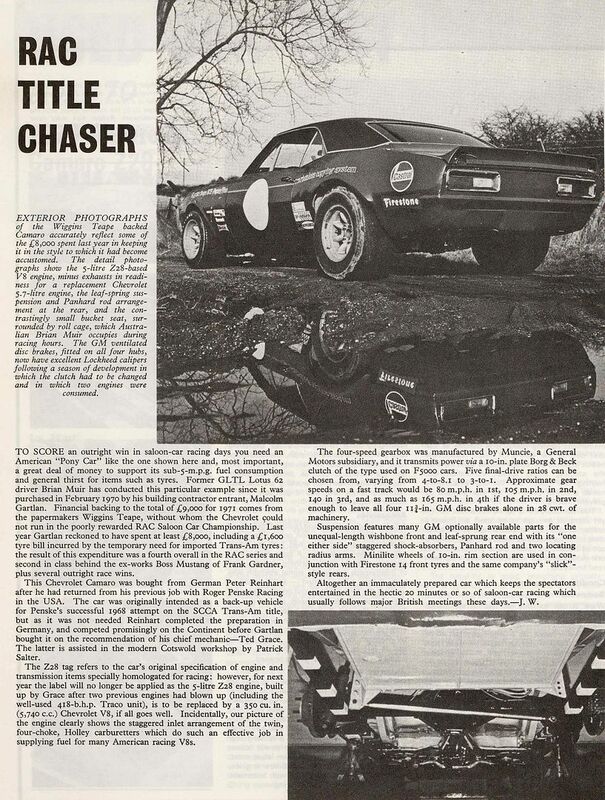 This article is from the March 1971 issue of Motor Sport magazine. Penske car. 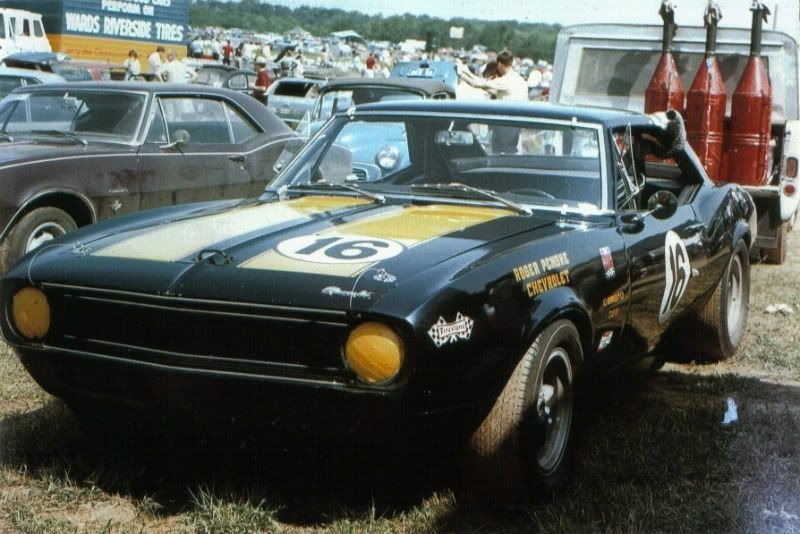 It is currently being raced by new owner Bill Bryan in Historic Trans-Am.